Anyone who's ever looked around market stalls will have noticed that there always seem to be a lot of Calvin Klein boxers and briefs on sale at very cheap prices - almost too good to be true. At least, they claim to be Calvin Klein, but the vast majority of them are going to be fakes, and the ones that aren't are seconds, properly called "second imports," not really endorsed by the design house. Between the fake and the cheap semi-official the market is flooded, and it's often hard to tell the difference between the two. But there are ways. Curiously, men's underwear is counterfeited far more than women's underwear, which is perhaps a surprise, given the massive market for lingerie. There are items on online auctions sites, but they're not as prevalent as men's underwear, perhaps because fit and feel is more important, meaning that women want to be able to see and touch before buying. 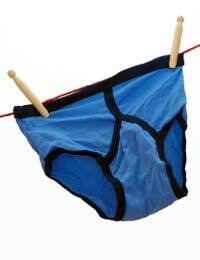 With relatively simple designs - there are really very few variations, men's underwear is simple and cheap to manufacture. That's especially true if you use cheap material, which the counterfeiters do. You only need to feel it to judge; it's flimsy, and won't hold up to many washes. But it's more than that. Cheap elastic gives out quickly, and the stretchiness which the real items have is missing, certainly after the first couple of times through the washing machine. This asks the question as to whether they're even worth the low price. Always check the items before buying. The name on the label doesn't mean a thing these days, not unless you inspect it. Although CK seems to be the most widely available, it's a problem that hits all designer underwear to a greater or lesser degree, and one that's difficult to stop. In part it's because these are relatively low ticket items, which don't receive as much scrutiny or attention. You have to feel sorry for poor Calvin Klein. They revolutionised the boxer short, especially the boxer brief, and made it cool again. Although they still dominate the designer end of the men's underwear market, their brand's reputation has been eroded by all the seconds and fakes available. The real item should have a product code, and it's easy to check that against the official codes (they can be found online). Counterfeiters tend to use the wrong or false product codes for their items. The stitching on the waistband should always be tight, even and firm. CK changes waistband designs regularly to try and fool the fakers, so be aware of current designs and compare against the item for sale. Real Calvin Kleins have distinctive packaging (make yourself aware of it), so always check the packaging on suspect items to be sure it matches for colour and clarity. Essentially, unless you buy underwear at a reputable shop - a department store, for instance - then you stand a good chance of buying a fake. Ultimately, you get what you pay for, although many men won't care about the label as long as the underwear does its job.